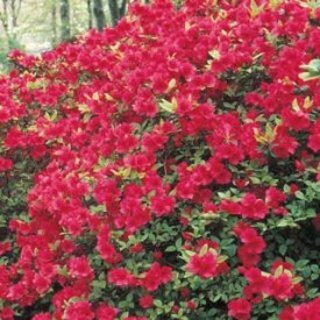 Features and Benefits Enjoy an azalea that is maintenance free and cold tolerant! Elegant masses of rich blooms dance atop eye-catching foliage every spring, creating a floral display that'll be the envy of the neighborhood. The first picture shows what these will look like when they are ready to bloom and mature, These will bloom by next summer. The second and third picture shows one of the actual plants we will be sending to you. The fourth picture shows a zone map so you know if these will work in your area. They will ship with dirt around the roots and will arrive to your home moist and ready to plant so you can enjoy for many years to come. Botanical Name:	Rhododendron x 'Hinode-giri', 'Mist of the Morning Sun' Form:	Evergreen shrub Sun Exposure:	Partial Shade Height/Habit:	2 - 3' Spread:	2 - 3' Spacing:	2 - 3' Hardiness Zone:	5 - 9 (-10 degrees F) Foliage Type:	Small glossy oval leaves. Flower Form:	Single funnel - form clusters. Flower Color:	Vivid rose crimson. Flowering Date:	Early spring. Planting Requirements:	Set at the same level it is at in the container, firm and water in thoroughly. Soil Requirements:	Well drained, humus rich, moist acidic soil. Growth Rate:	Slow to moderate. Unique Characteristics:	Compact dense foliage grows in a sprawling fashion. One of the hardiest of the evergreen Azaleas. Small glossy leaves turn bright red in winter. Multitude of vivid red flowers cover the plant in early spring. Pruning:	Trim to shape after flowering. Size at Shipping: Currently shipping with some dirt intact around the roots, 10-16 inches at time of shipping give or take.